After two weeks at Culnacraig over Easter, we are now back home and completing the new website. The higher mountains of the north west highlands such as An Teallach and Beinn Dearg still had a good covering of snow above the 3000 ft level, but the west coast peaks such as Ben Mor Coigach and Suilven were snow free apart from the occasional patch of old snow, and some fresh snow showers from time to time. 173 Culnacraig was as cosy as ever, and the daffodils were beginning to flower in the garden, whilst the first violets and primroses were appearing on the Postie’s Path and on the slopes of Ben Mor Coigach by the Allt nan Coisiche. We saw ptarmigan high on Ben Mor, as well as red grouse. Several red deer were frequently seen in the valley, completely at ease with human presence, and could easily be approached to within about 50 yards. One night there was a spectacular aurora borealis (northern lights) with eerie green light shimmering over Conmheall, one of many strong auroras seen in northern Scotland this winter. Loch Broom is now part of the Wester Ross Marine Protection Area (MPA), from Ullapool and out to Achiltibuie, Gairloch and beyond. 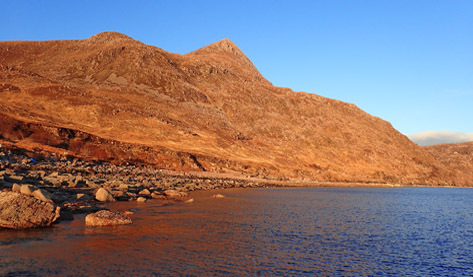 A fine spring evening on the shore below Culnacraig with the peak of Garbh Choireachan above (part of Ben Mor Coigach).